Site utilities for this project include their installation for the new house as well as connection fees and monthly payments for temporary power, water, and any other services necessary to complete its construction. Power connections are made to utility lines that extend from a transformer capable of serving the building. For light residential construction, transformers are installed to supply several houses through metered connections that are turned on by the utility company that will be supplying the power. Overhead supply lines drop from raised main lines strung across roads and public areas. Underground service must be installed in a protective conduit or a reinforced heavy duty cable that is then inspected for compliance with detailed specifications prior to burial. For the construction, a temporary power pole is placed on site according to the site utilization plan (SUP). 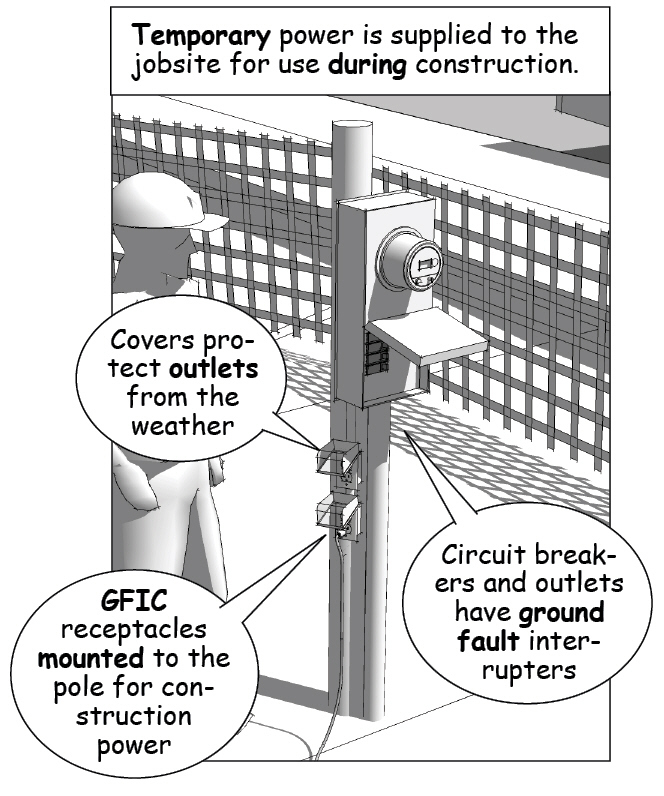 The size, location, and grounding for the metered connection must again comply with local electrical codes before it can be connected. 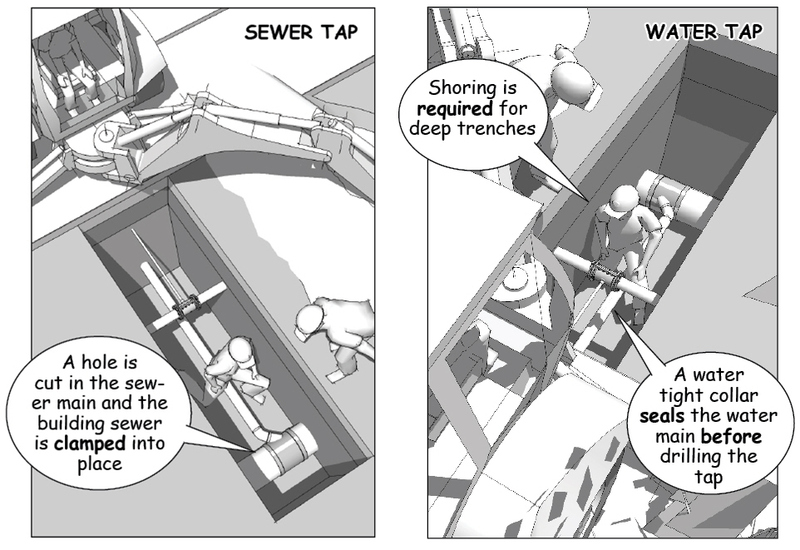 In some cases, utility taps must be made to manholes or underground service boxes that require a street cut. 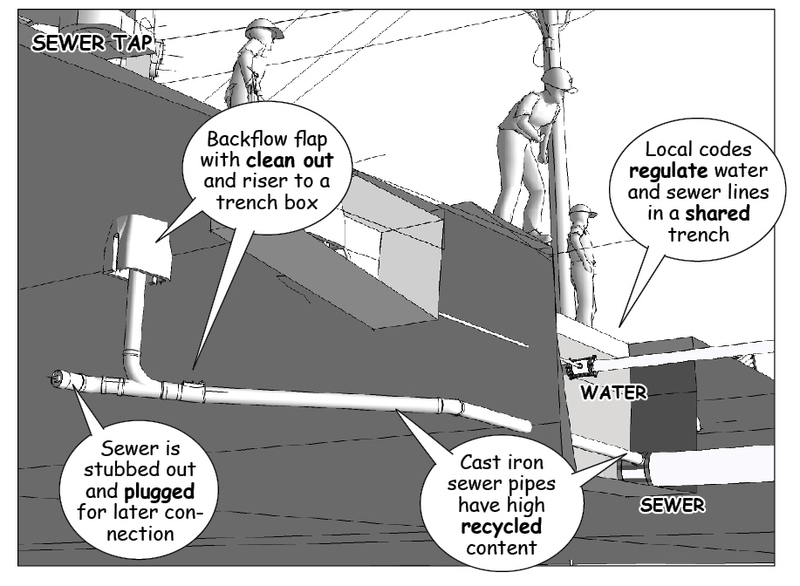 This is almost always the case for sewer, water, and gas connections. 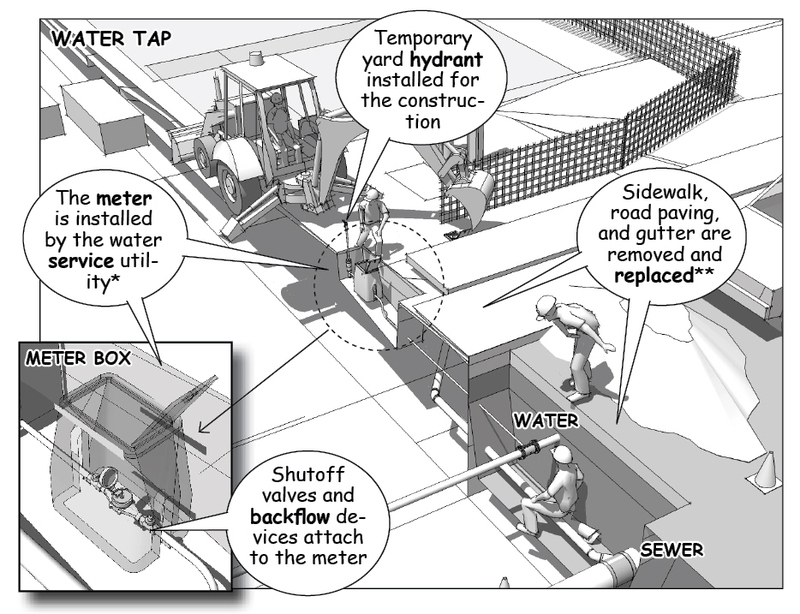 The extent of the work necessary to tap into utilities under a public right of way depend on the preparation needed to protect vehicular and pedestrian traffic, the location and depth of the mains, and the cost of repairing the road and other public property following the requirements local officials. In some cases certified subcontractors or special permits are required, drawn by the contractor to show details for roadwork, curb cuts, and excavation because of safety concerns for injury during and after the installation. For example, shoring is required in unstable soil or for trenches more than 5 feet deep, along with railing and falsework for sidewalks, and silt barriers for erosion control. Because of existing hydraulic pressures, special precautions must be made to tap into an active utility main and avoid interrupting service to current customers or damaging other utility lines during the installation. Hot taps like these for major constructions are made by specialists using a special clamp, bolted or welded onto the sewer or water main. The clamp has a water tight collar and is engineered to seal the mainline. 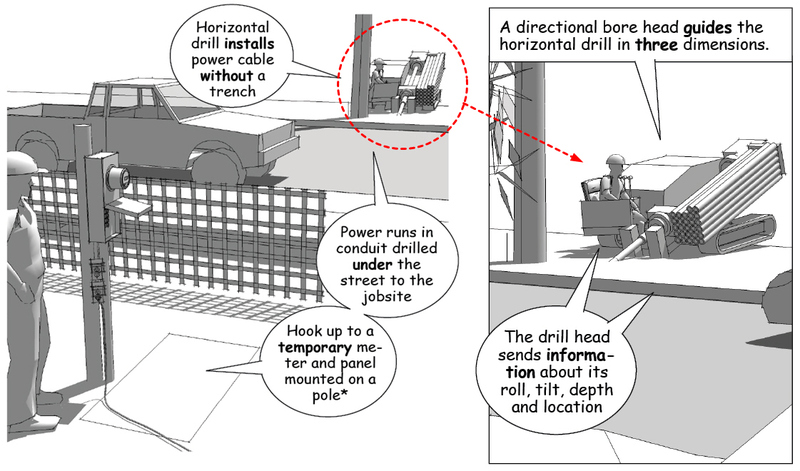 Once in place, the drill or cutting head is mounted to a series of valves that are then reset to remove the cutter and any debris before opening the flow to or from the building. The process can be competitive as you can see here. Once the taps have been completed, shut off valves, back flow protectors, and meters are installed. The connections are then inspected and recorded, and the area backfilled and refinished according to public works specifications. Important is that the street, sidewalks, and any areas damaged by the work must be repaired or replaced. In most cases this means new sidewalks, curbs and gutters, as well as landscaping and vegetation that must be listed as line items in the costs shown on a construction contract.